In an article recently posted on his website, Dr. Joseph Mercola has made baseless allegations that the low-calorie sweetener sucralose causes obesity and is as dangerous as DDT. The Calorie Control Council notes that an overwhelming body of science supports the fact that sucralose has an excellent safety profile and has been conclusively tested in more than 100 studies over a period of 20 years. The scientific evidence has found no link between obesity and sucralose. Mercola’s comparison of the structure of sucralose to DDT (dichlorodiphenyltrichloroethane) is without scientific merit. Sucralose is made from sugar by a process that substitutes three chlorine atoms for three of the hydroxyl (-OH) groups on the sugar molecule. As such, it is a substituted carbohydrate. DDT is an organochlorines molecule. Mercola’s opinions are not in agreement with the overwhelming consensus of the scientific community in a wide variety of areas. For example, in March 2011, Mercola received a letter from the U.S. Food & Drug Administration (FDA) requesting that he immediately cease making unauthorized claims about breast cancer screening techniques that are not recognized as appropriate by the medical community. Mercola is equally off-base and out of touch regarding sucralose. The safety of sucralose is documented by one of the most extensive and thorough safety testing programs ever conducted on a new food additive. Unfortunately, some individuals and organizations like Mercola’s have taken results from some of the safety studies out of context, to try to raise doubts about the safety of sucralose (e.g. highlighting the results of a study that was not designed to assess a particular health parameter, while ignoring the results of other studies that were). Such out-of-context criticism could be made of the focus of any scientific study. It is bad science, scare-mongering and plain wrong. In his article, he claims that sucralose destroys gut flora in the human stomach. However, the study he cites, by Abou-Donia et al., has many flaws in its methodology, including a lack of proper control groups. The control group consumed plain water, which does not provide an applicable means of metabolic comparison. The control group’s diet contained no sucralose or carbohydrate (e.g., maltodextrin) and therefore does not serve as a useful means of comparison. A statement by the Calorie Control Council on the flaws behind the Abou-Donia et al study can be found here. Mercola goes on to claim that sucralose causes obesity and was never proven to be safe for human consumption. The fact is that although sucralose is made from sugar, the body does not recognize it as sugar or a carbohydrate. It is not metabolized by the body for energy, so it is calorie-free. The vast majority of ingested sucralose is not absorbed and simply passes through the digestive system. The small amount of sucralose that is absorbed is rapidly eliminated in urine as sucralose. Sucralose is highly water soluble. Because of this, sucralose does not accumulate in the body. DDT is nearly insoluble in water, but highly soluble in organic solvents, oils and fat. This ability for DDT to dissolve into fat allows it to accumulate in the body, and is one mechanism for its toxicity. Sucralose has been shown to not cause cancer. DDT is suspected to cause cancer . The National Toxicology Program (NTP) classifies DDT as “reasonably anticipated to be a carcinogen,” the International Agency for Research on Cancer classifies it as a “possible” human carcinogen, and the EPA classifies DDT as a class B2 “probable” carcinogen. Leading medical, scientific and regulatory authorities around the world have considered the safety of sucralose – including the FDA, the European Food Safety Authority (EFSA), Health Canada, Food Standards Australia/New Zealand, Japanese Food Sanitation Council and the Joint (Food and Agriculture Organization/World Health Organization) Expert Committee on Food Additives (JECFA). All have found sucralose to be safe for use as a food ingredient by the general population, including children and women who are pregnant or breast-feeding. It is also suitable for people with diabetes, because it does not affect blood glucose or insulin levels. In fact, studies clearly indicate that sucralose does not cause tooth decay, cancer, genetic changes or birth defects – and has no effect on carbohydrate metabolism, short- or long-term blood glucose control or insulin secretion or human reproduction. As a food ingredient, sucralose has been used to create whole new categories of food and beverage products, such as reduced-calorie cookies, cakes, ice cream toppings and fruit and pie fillings, and is sold as a tabletop sweetener under the brand name SPLENDA® in two forms – granular and packets. It also has been used to expand markets for existing low-calorie products, such as jams and jellies, chewing gum, and carbonated soft drinks. The availability of sucralose will continue to expand the market to provide products with improved taste, increased stability, lower manufacturing costs, and, ultimately, more choices for consumers. 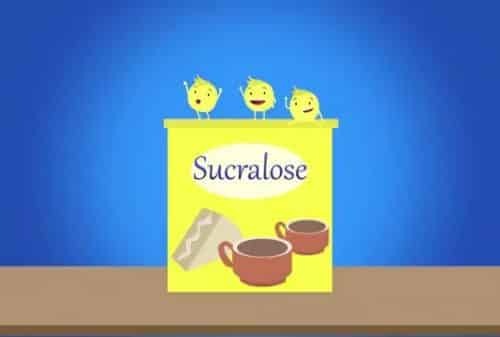 More information about sucralose is available via the Internet at www.sucralose.org.